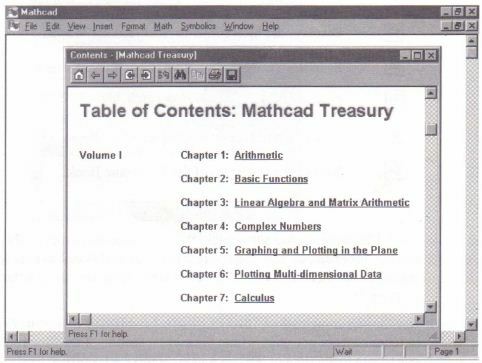 • If you have your own Mathcad worksheet open, you can copy working examples and formulas from the Electronic Book simply by dragging and dropping them into your worksheet. The Resource Center, which comes with Mathcad, is itself an Electronic Book, -and more than 50 additional titles are now available, including the best-selling The Mathcad Treasury, by Paul R. Lorczak. If you are using Mathcad Professional, your Resource Center includes two chapters excerpted from this Book. For more information about Mathcad Electronic Books and other products, contact MathSoft or your local software distributor or reseller, or click on the Web Store button in the Resource Center. • Choose Open Book from the Help menu. 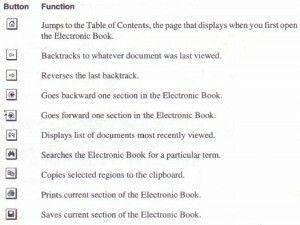 • Use the Open Book dialog box to locate the book. The file extension. 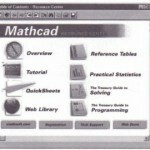 hbk is used for Mathcad Electronic Book files. The title for any book you locate is displayed at the bottom of the dialog box. • Choose Open from the File menu. 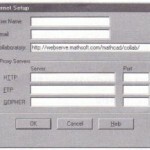 • Set the “Files of Type” box to “Mathcad Electronic Book (*.hbk).” The file extension . 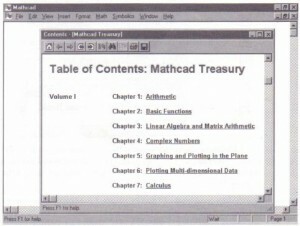 hbk is used for Mathcad Electronic Book files. • Browse to find one of the available Electronic Books you have installed. When you click in the book with the right mouse button, you will see a Books context menu with commands appropriate for using your Book. As in other hypertext systems, you click on underlined text or icons to move from section to section. The mouse pointer automatically changes into the shape of a hand when you let it hover over a hypertext link, and a message appears at the bottom of the window that tells you what will happen when you click on the link. Then, when you click on a link or cross-reference, you automatically open the appropriate section or display information in a pop-up window, depending on how the book is organized. You can also use the buttons on the toolbar at the top of the Electronic Book window to navigate the Electronic Book and take advantage of the content you find there: Some Electronic Books show additional buttons in the toolbar. 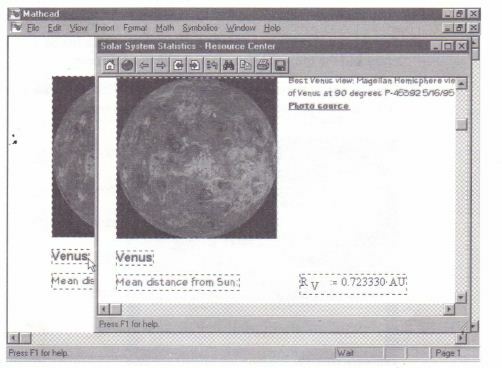 The Resource Center toolbar, for example, has a button that opens an additional toolbar for Web browsing in the Resource Center window, as described in “Web browsing in the Resource Center” on page 38. 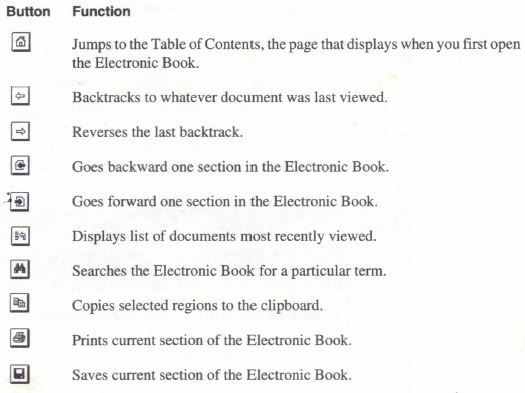 Use the key combinations [Shift][PgDn] and [Shift][PgUp] to move down or up in increments of one page within the current section of the Electronic Book. To move one screen to the right or left, click to the right or left of the scroll box in the horizontal scroll bar. Click on “Next” or “Previous” to bring the next or previous occurrence of the entry into the window. If “Next” is grayed out, the last occurrence of that word is currently visible. If “Previous” is grayed out, the first occurrence of that word is currently visible. Note that this feature will not locate any annotations you may have saved using the Annotate Book command, described in “Annotating an Electronic Book” on page 45. • Press and hold down the mouse button to anchor one corner of the selection rectangle. • Without letting go ofthe mouse button, move the mouse so as to enclose everything you want to select inside the selection rectangle. • Release the mouse button. Mathcad encloses the regions you have selected in dashed selection rectangles. 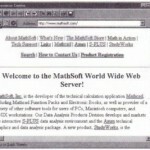 If you select only one region, Mathcad surrounds it with a selection box. 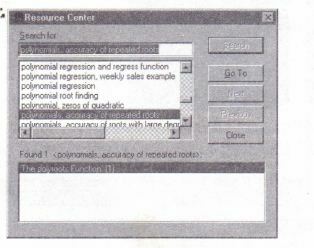 Now drag a copy of the selected regions into your worksheet, as shown in Figure 2-5. Figure 2-5: Copying selected regionsfrom an Electronic Book to a worksheet. • Place the pointer over any selected region in the Electronic Book. The pointer will turn into a small hand. • Hold down the mouse button. Without letting go of the button, move the mouse. You will see the rectangular outlines of the selected regions move as y\,u move the mouse.